Aqua K-Othrine® is a space spray concentrate containing 2% deltamethrin. Deltamethrin is a highly active pyrethroid insecticide which will effectively flush insects out of their hiding places and kill through direct contact. Due to the high activity of deltamethrin Aqua K-Othrine® can be applied at extremely low dose rates of 0.5 - 1.0 g/ha of active ingredient to control public health insect pests including vectors of disease as well as nuisance flies and mosquitoes. Aqua K-Othrine® utilises a unique patented anti-evaporant technology which makes it easy and convenient to use with reduced irritancy, odour and environmental impact. Aqua K-Othrine® formulation is based on water and this highlitghts the specific benefits of the formulation. 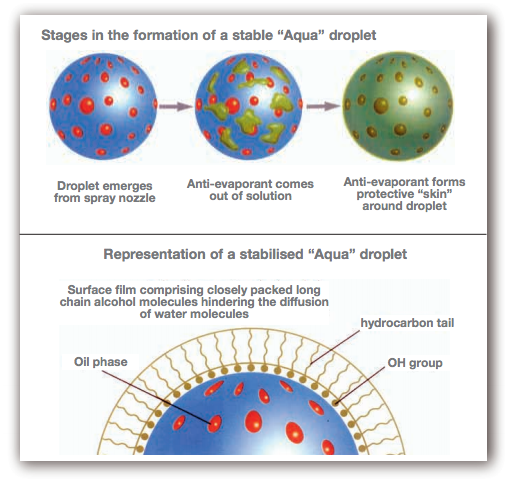 The Film Forming Aqueous Spray Technology (FFAST) is a unique patented formulation system which allows the use of water as the diluent without the normal drawbacks of evaporation. The principle behind FFAST is simple yet extremely effective. As each droplet is formed, long chain alcohol molecules rapidly migrate to the surface where they align to form a protective skin. This gives a sealed package of water-based insecticide, thereby retarding evaporation and greatly extending the effective range of the spray. The key result of this is that Aqua K-Othrine® provides long-lasting effective droplets in all climatic conditions and is as effective as oil/diesel diluted space spray concentrates when sprayed at equivalent active ingredient rates. Aqua K-Othrine® is easy to use, a user friendly concentrate producing a space spray that minimises flammability, smell, staining, paintwork damage, toxicological risk and pollution. Water is the natural choice for the diluent of space sprays, particularly in the light of increased concern about the use of diesel. However, water-dilutable emulsifiable concentrate (EC) formulations may give poorer insecticidal performance in comparison with diesel or oil-diluted products. This is due to evaporation of water (which is more volatile than diesel) from the spray, leaving droplets which are too small for efficient impaction on the insect. By using water as the main solvent, as well as the diluent, Aqua K-Othrine® can offer a number of specific benefits to the user. Aqua K-Othrine® is clean, easy to handle concentrate which is completely acceptable in use since it has virtually no odour. The water-based formulation eliminates the risk of fire, as well as reducing paint spotting and staining. Water is the natural choice for the diluent because it is readily available and offers genuine cost savings to the user compared with oil or diesel diluents. Aqua K-Othrine® significantly reduces environmental pollution because the formulation is water-based and water-diluted. The active ingredient deltamethrin is rapidly degraded in the natural environment and the low dosage rates of 0.5 to 1.0 g / ha again contribute to a reduction in environmental contamination.